Having grown up on Campbell's from the can plopped into a pan and heated to boiling, the idea of a cold soup, much less one made from scratch, was a complete revelation. Cold cucumber soup, along with gazpacho, that crazy good concoction of garden-grown tomatoes and whatever vegetables were in season, were my gateway drugs of choice. 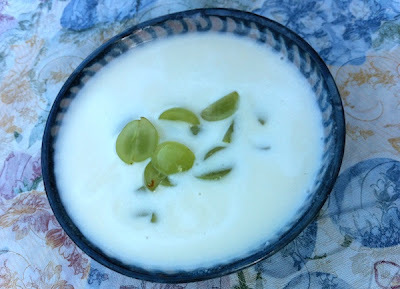 The other night at my friends Judy and Tom's, I got another chilled bowlful of summer to add to the list: a so-called "white gazpacho" that Judy learned to make when Tom was teaching in Spain (see her recipe for feijoada from their Brazil sojourn). Cool and light with that requisite zing from the garlic and a soothing sweetness from halved grapes, this was a perfect starter to a summer evening in the back yard. It would also be terrific poured into a lidded pitcher and taken on a picnic (or a concert on the lawn) with a rotisserie chicken from the store and maybe a fruit salad with some chilled rosé. Hmmm…do I sound ready for some summer fun? Put slices of bread in water to soak. Peel garlic. While bread soaks, put garlic and almonds in processor or blender and pulse until smooth. 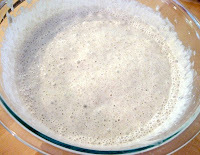 Squeeze water from bread, tear into pices and add bread and salt to blender. While blending slowly, add oil, vinegar and finally water to blender. Taste, adjusting salt, vinegar and oil to taste. Chill at least 2-3 hours or overnight. Serve grapes on side, or put several in soup bowl and pour soup over grapes. Serves 4. It's kind of like that PBS show "Connections" with James Burke, whose comb-over was third in line to that of "Guns, Germs and Steel" author Jared Diamond and former Portland TV newsman Boyd Levet back in the Mt. St. Helens days. But I digress. The connection I'm talking about is the one between the price of farm-produced raw milk and the vacation schedules of middle-class Portlanders. Got it? Well, as explained by Chrissie Zaerpoor of Kookoolan Farms, it has to do with the reduced demand for the milk her cows produce due to the fact that many of us city folk go on vacation in July just as the cows' production is peaking. This makes for a glut of milk for not enough buyers, which causes her to lower her prices to compensate. So if you're a lover of raw milk, you can make an appointment to pick up a gallon or ten from her farm store in Yamhill. And what to do with all that milk? 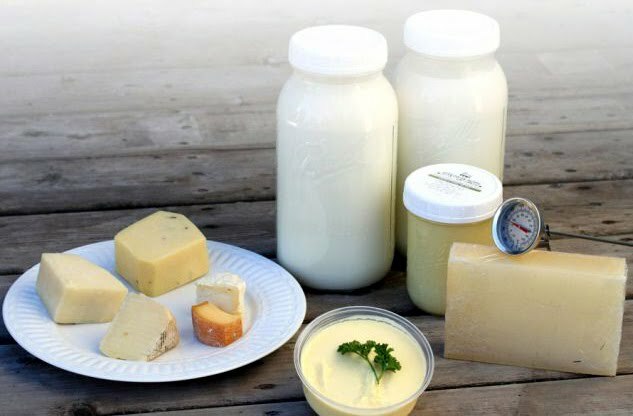 Well, for starters, if you're the DIY type she has local cheesemakers teach classes at the farm (and sells cheesemaking supplies, as well), and she also has recipes for making your own butter and ice cream from the milk (see below). Also, if you're feeling particularly motivated and you're interested in starting your own herd, she's selling two of her best producers, Token and Glitter, to good homes. For milk or the cows it comes from, get in touch by e-mail or by phone at 503-730-7535. To make ice cream, combine 3 cups cream; 1/2 cup sweetener such as sugar, Rapidura, honey or maple syrup; four raw egg yolks; and 1 tsp arrowroot powder in a blender. Add whatever flavoring you desire, such as 1 tsp. vanilla extract. Then process in your ice cream maker. Variation: replace sweetener and flavoring with one jar of Ayers Creek berry jam. Homemade ice cream keeps well in the freezer for up to a year. To make butter, let cream set out at room temperature for about six hours to warm up and ripen, then mix it in your food processor until butter comes together in granules. Drain off the buttermilk for use in biscuits or pancakes. Rinse the butter granules in ice-cold water until the water runs clear, then use a damp towel to press out the excess water. Salt the butter if desired, roll into logs, wrap in clear plastic wrap and freeze almost indefinitely. Raw butter spoils very quickly in your refrigerator or at room temperature because hand-processing does not remove all the casein from the butterfat, so keep frozen until ready to use. Last night we were invited to dinner at the home of friends and, as usual, I asked what we could bring. "Oh, maybe an appetizer. But nothing fancy," was their reply. Now, they were serious about the "nothing fancy" part, but I know this particular couple loves a good starter and so I was mulling over the possibilities. It's not yet tomato season, so a caprese bruschetta, one of my own top-of-the-list apps, was out of the running. And Asian chicken wings sounded tasty, but might be a little much since steaks were on the menu for dinner. A fava bean and mint spread would be seasonal and appropriate, but the farmers' markets were already over for the day. 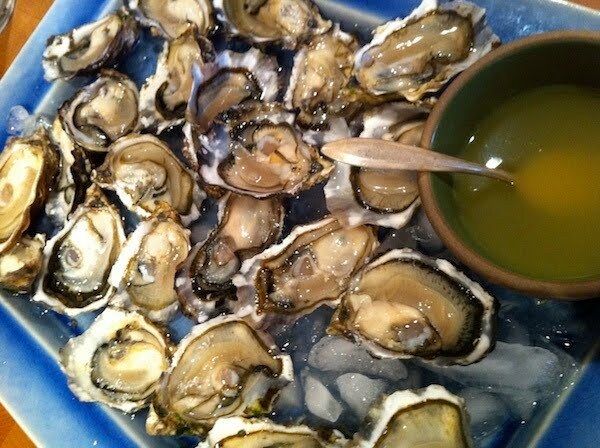 Then it hit me: fresh oysters! Light yet wonderfully flavorful, totally seasonal and local, and relatively inexpensive yet classy. And though Dave and I aren't big on complements other than the occasional drop or two of lemon with our bivalves, a mignonette seemed like a fun addition. There are at least two sources of fresh NW oysters in town, Dan & Louis' Oyster Bar and Newman's Fish Co. in City Market, with prices around $12-$18 a dozen or so, depending on the variety. Dan & Louis had Pickering Pass oysters from Washington for the lower price, so we dropped by and picked those up on the way to dinner. I'd whipped up a slightly esoteric ginger lemon mignonette, which was wonderful with the creamy, briny little oysters and got some nice props for my choice from the hosts. If you're looking for something a little off-the-beaten path for apps this summer, I'd recommend giving oysters a try. And let me know if you've got a fave supplier in the area…more sources are good! Combine vinegar, ginger, lemon zest and salt in small bowl, stir, then allow to steep for 10 min. Strain and add green onion, if desired, before serving alongside fresh oysters. It might sound strange, but I don't read many food blogs on a regular basis. Not that there aren't tons of great ones out there, but between working on stories for GSNW, walking dogs, writing assignments and trying to maintain a bare modicum of order, not to mention sanity, around the house, I just don't seem to find the time. So it was great on a recent trip to Seattle to meet some other writer/bloggers like the women who write the Daily Blender and Purple House Dirt blogs. Jenny of PHD is an accomplished baker and photographer, and her site is a wonderful collection of recipes and reflections. 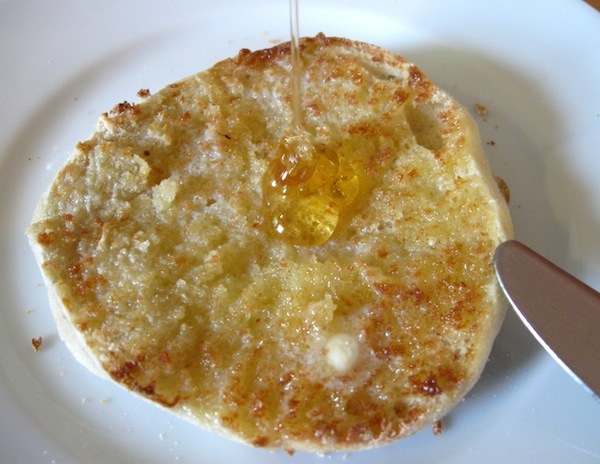 A recent post about making English muffins caught my eye, at first because the drool-worthy photo reminded me how long it had been since I'd had a decent version of that cratered bread, toasted and slathered with butter and jam. Then I noticed that it was also made with sourdough starter, a method that Dave's been perfecting lately (above left), so I forwarded him the link to the recipe. He got all excited and made them immediately, with a well-worth-repeating outcome (right). 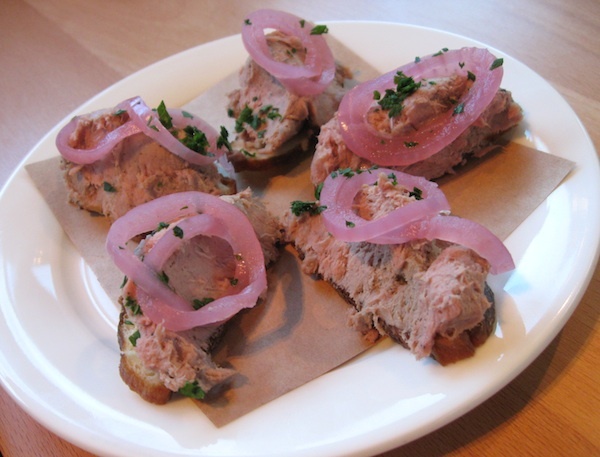 A hint: they're really at their best when refrigerated or frozen after cooling, then sliced and toasted the next day. Pull out your best butter and jam or serve them to guests for breakfast. They will be astounded ("Really? 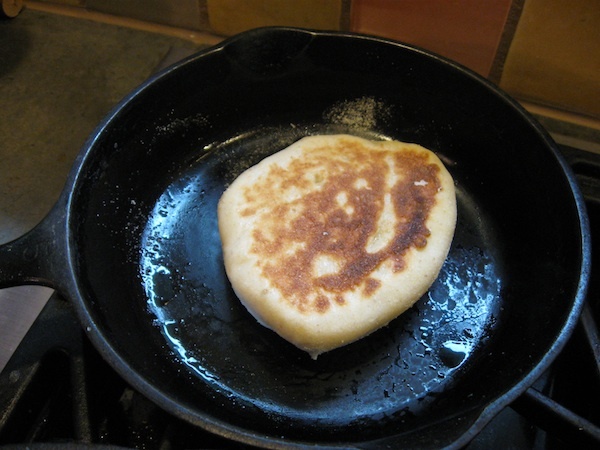 Homemade English muffins? Wow!") and grateful. The plants in my garden are rubbing their little eyes, waking from a sleep brought on by cool temps and too much rain, and hopefully thinking it might be time to do some growing. If you're like me and have way more produce coming in than you can use, consider giving it to people in our community who don't have enough to eat. The Plant a Row for the Hungry program distributes homegrown produce to hunger-relief agencies, providing much-needed fresh vegetables and fruits to hungry families and individuals. There are drop-off sites all over the city, so get growing! Details: Plant a Row for the Hungry. A list of what to grow and donate, as well as drop-off sites here. Farmington Gardens in Beaverton is also accepting donations Sundays and Wednesdays, 10:30 am-noon, at 21815 SW Farmington Rd. Operating in a century-old farm that, when it began, was way out in the country, Zenger Farm is now a non-profit urban farm. 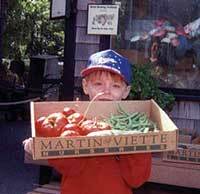 Dedicated to promoting sustainable food systems, environmental stewardship and local economic development, it utilizes the combination of a 10-acre wetland adjacent to the 6-acre organic farming operation to provide unique experiential learning opportunities for youth, farmers and families. You can help celebrate farming in the city at their annual picnic on August 14 and take a farm tour, enjoy a local picnic prepared by Bon Appetit Chef Joe McGarry, listen to live music and watch an outdoor movie projected on the side of their barn. What better way is there to enjoy a summer evening in the city that to spend it on a farm? Details: Zenger Farm Annual Picnic. Sat., Aug. 14, 5 pm; tickets $15-35 (sliding scale), children under 12 free, available at the farm on the day of the picnic. 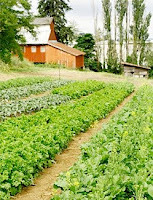 Zenger Farm, 11741 SE Foster Rd. 503-282-4245. Now that summer is officially in full swing, local festivals and fairs are starting to crowd the calendar with beer, wine, music and all manner of activities, with the seasonal surge in the consumption of curly fries. 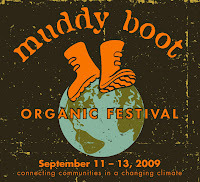 One event that seems particularly worth noting is the Muddy Boot Organic Festival which this year will explore urban farming, homesteading, food policy and more with the theme “Nourishing Spirit: City to Farm.” Look for hands-on gardening and farming activities for kids and grownups, workshops on urban farming and sustainable food and more. Personally, I'm excited that GSNW friends and Peabody Award-winning movie men Curt Ellis and Ian Cheney will be presenting the keynote address on Sept. 10! 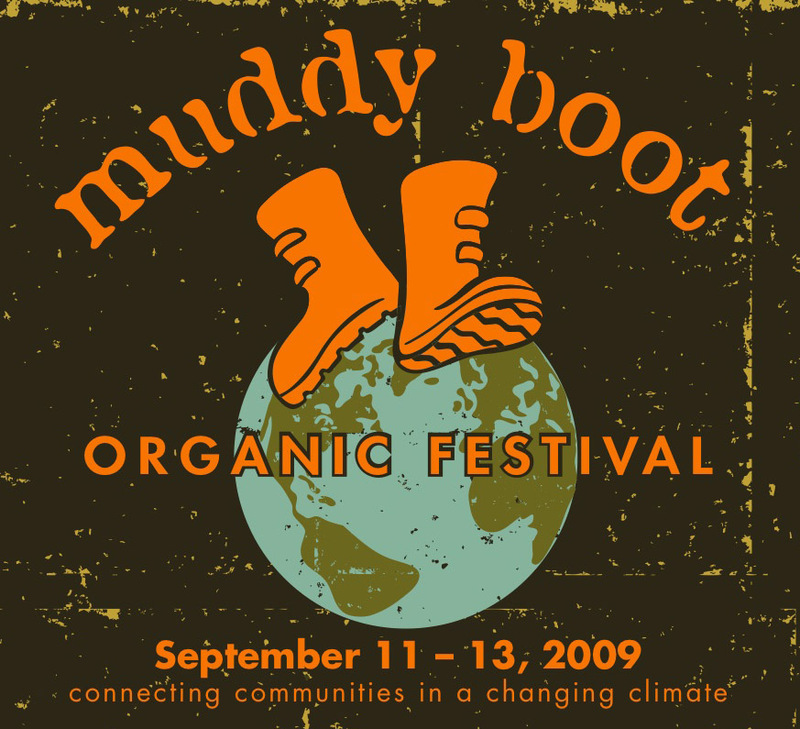 Details: Muddy Boot Organic Festival. Sept. 10-12; $5 admission per day, keynote additional. St. Philip Neri Church, 2408 SE 16th Ave. (near 18th & Division). 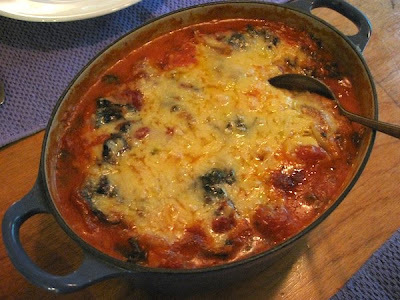 I love contributor Jim Dixon's recipes because they're easy, seasonal and oh-so-tasty. He's also a fiend for fritters, the best part being they don't need to be deep-fried! Look for his RealGoodFood booth most Saturdays at the Portland Farmers' Market at PSU filled with his incredible olive oils, vinegars, beans and grains. I must be slipping. 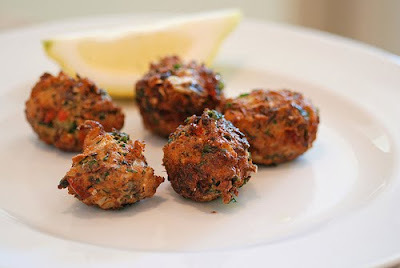 I haven’t included a recipe for fritters for weeks (although the pork balls from earlier are really just meat fritters). I still cook and eat some version of these little fried things (called “subrich” in Piemontese dialect and based on a recipe from Faith Willinger’s Italian vegetable cookbook) at least once weekly. Here are a couple I’ve made recently. Drop a bunch of dandelion greens into well-salted boiling water, cook for about 2 minutes, then remove, cool and squeeze out as much water as you can. Chop into small pieces. Mix with about a cup, maybe more, of fresh herbs. I used what I’ve got in my garden: sage, oregano, rosemary and sorrel. Mint would be good, too. Add a finely chopped spring onion (I have these in the garden; shallot, garlic or plain onion work, about a couple of tablespoons total). Grated Parmigiano Reggiano is good, but not absolutely necessary. Add a little salt. Mix in a couple of eggs and about a cup of breadcrumbs. The mixture can be a little wet, but should hold together enough to form walnut-sized lumps using two tablespoons. Slide the lumps into reasonably hot olive oil (enough to cover the bottom of your skillet, and they should sizzle a bit). Use the spoon to gently flatten the fritters, let cook undisturbed for a few minutes, then turn. You want them nicely browned. Sprinkle with flor de sal and eat immediately. Combine a tin of good sardines (I used olive oil-packed) with a couple of potatoes that you’ve cooked, peeled, and crumbled into a bowl. I used yellow spuds, poked and microwaved for about 4 minutes each. Mix in a couple of cloves of finely chopped garlic and, if you’ve got them, some salt-packed capers that you’ve soaked and rinsed. Follow the directions above for adding eggs and breadcrumbs; cook the same way, too. Here's a recipe for Jim's squash fritters. 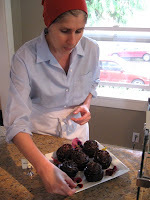 Top photo from CookThink.com. Opening day of any farmers' market is worth celebrating, but the opening day of a brand new market is momentous. 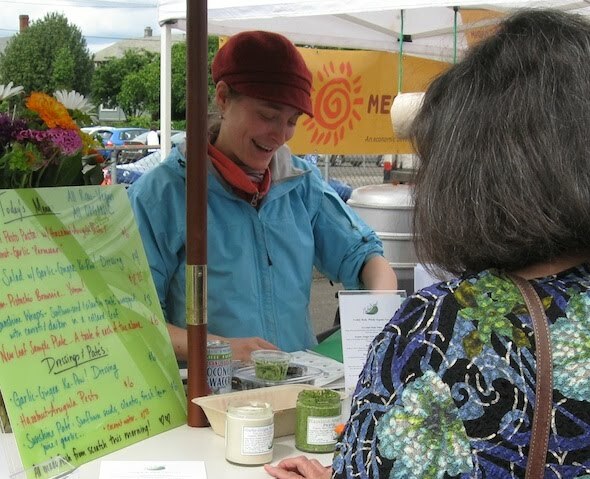 Northwest Portland had been without a farmers' market since the Ecotrust market closed down last year, and the rumor mill was working overtime with conjectures about where a new one might pop up and who would sponsor it. Would the Hillsdale market expand its reach into Portland proper? 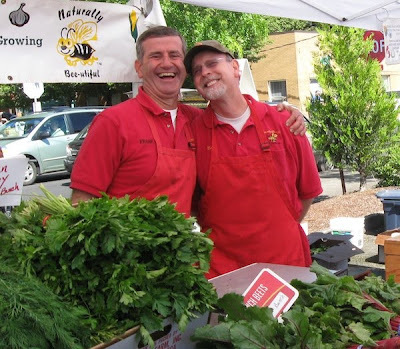 Would a local co-op launch a market in its neighborhood? Though no one was too surprised when the big kahuna, Portland Farmers' Market, announced it would open its sixth market in the parking lot of Con-way trucking at NW 23rd and Savier, and have a market on five out of seven days of the week. 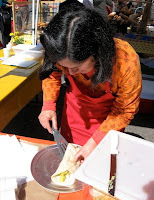 Stalwart PFM vendor Springwater Farm was there with chef Kathryn Yeomans dishing out samples of spring morels sautéed with garlic, and Eric Montano was proudly displaying a dizzying variety of his heirloom, open-pollinated potatoes and greens at Prana Farms (top photo). The New Leaf (left) was there, too, with its garlic ginger Ka-Pow salad dressing, hazelnut arugula pesto and a raw, organic, dairy-free, gluten-free Sunshine Paté. The best part? It was nice to see regular folks chatting and shopping along NW 23rd's carefully cultivated upscale-ishness. Details: NW 23rd Farmers' Market. Thurs., 3-7 pm. On NW 23rd and Savier in the parking lot of Con-way Inc.
Dan Straub, owner of Soluna Grill on NE Fremont, was talking with his shellfish vendor on day and the subject of farmers' markets came up. Since Dan had a parking lot and the vendor had fish and pickled asparagus to sell, they set up a little market three Sundays ago. 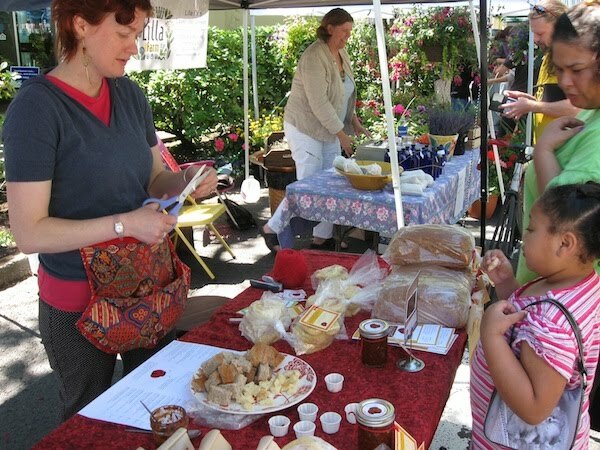 Since then that vendor has been joined by a couple of neighborhood crafters, an urban farmer from the adjoining Cully neighborhood and, last weekend, 19th Street Farms from West Linn. Dan's looking for other vendors who might want to join the little market but mostly, he says, "I'm just wanting something for people out here to walk to." Details: Fremont Craft and Farmers' Market. Sun., 10 am-3 pm. 4440 NE Fremont. 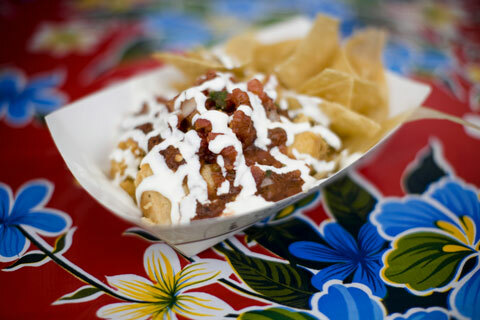 Phone Soluna Grill for information, 971-222-3433. 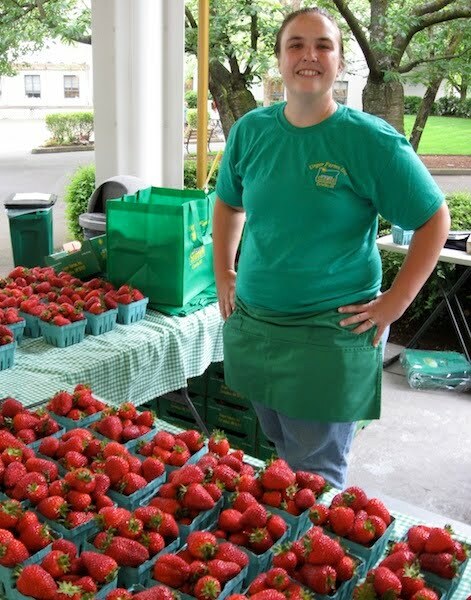 With the late start to summer, many farmers are saying the crops they'd normally harvest in June won't be ready until August, which should be good news to the residents of the Cully neighborhood who will have a new farmers' market opening July 10th. 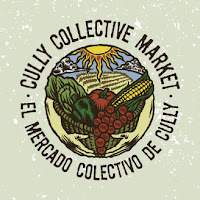 Called the Cully Collective Market, its mission is "to bring healthy, affordable, locally produced food to Cully residents and to provide a space for neighbors to exchange goods and culture while creating economic opportunity in our neighborhood." 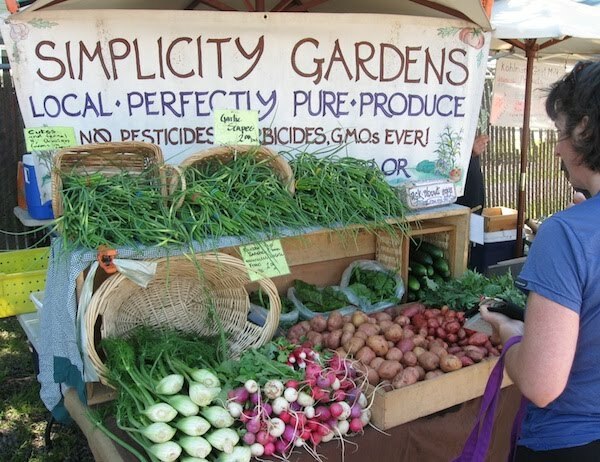 While it will have traditional produce, food and craft vendors, it will also feature Community Tables, allowing neighbors to sell, barter and trade for produce and household items. It should be a unique presence on the market scene, and I'll definitely keep you posted. Details: Cully Collective Market. Sat., 9:30 am-1 pm. In the parking lot of Trinity Lutheran Church & School, 5520 NE Killingsworth St. When our son was four years old we took a trip to France, and since we've never been interested in the four-star, play-it-safe experience, we've always opted for a more ground-level view. That meant staying in small, family-run hotels and eating in local restaurants, most of which weren't geared for English speakers. Contrary to stereotypes of the French, the innkeepers were invariably helpful and friendly, even reverting to the English they learned in school, much better than my college French, to give us pointers on what to see and where to eat. It didn't hurt that our son loved escargot and duck more than pizza or hamburgers, which seemed to amaze our hosts, and we were able to bask in the reflected approval. Our days would always start in the small breakfast room of the hotel, the innkeeper bringing two long-handled metal pots, one filled with strong coffee and the other with hot milk. A simultaneous stream from each would be poured into our cups, and a basket of pastries or a baguette from the village bakery would appear, often accompanied by homemade jam. 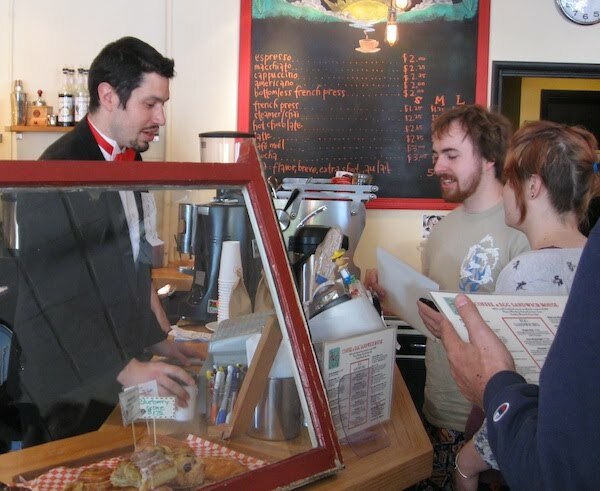 The reason I bring this up is that we went by Florio Bakery on a recent morning when Carrie Birrer (left) was just setting out the day's pastries, the smell of cinnamon and sugar mixing with the heady richness of just-brewed Trailhead Roasting espresso. 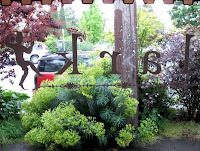 You may remember her from the coffee shop of the same name on SE 28th and Ankeny, and this one, located in a little bungalow just off MLK, has many of the same wonderful French-style pastries, along with her famous (and much missed) scones (lower right). Light spills into the south-facing room containing the pastry counter and espresso machine, and there is an adjoining room with tables where you can sit back and watch the neighbors passing by on their daily errands. It already looks like a popular spot for moms and their kids, with a basket of books and toys to keep them busy while their mothers sit and relax. In a departure from the typical coffee shop model, the scones are also available at several local stores in the freezer section under the Florio label. 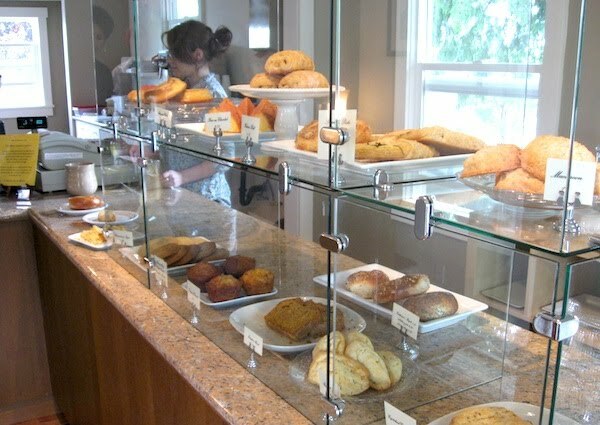 At the café she's also offering ready-to-bake frozen scones and croissant dough filled with fruit or savory fillings to customers who may want to have her freshly baked pastries without having to change out of their jammies. I'm thinking this is going to be the ideal solution for breakfast for overnight guests or to have on hand when a friend stops by for coffee. Birrer is also marketing her pastries this season at the St. Johns Farmers' Market on Saturdays, and she's talking about expanding her café menu to include lunch offerings in the near future. As for me, I'm going to be heading there as a tasty destination for a dog walk, and to pretend for a few minutes that I'm back at that small hotel in France. Details: Florio Bakery, 431 NE Rosa Parks Way. Phone 503-928-9444. Sending this out to all you groovy daddy-o's out there. Happy Father's Day! The lights were low, the seats cozy. 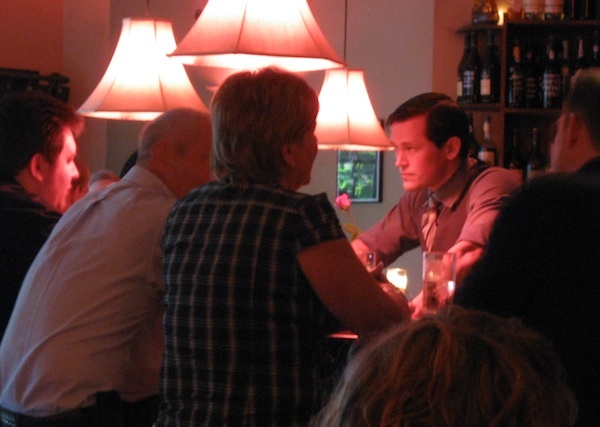 A black-and-white clad waiter came to the table and her question always threw me into an existential panic. "Would you like a cocktail?" Wine and beer, no problem. I could order with the best of them. But a cocktail? It was terra incognita. All the bottles in my parents' liquor cabinet would swirl around in my brain, out of focus. If I was lucky I'd remember gin and tonic. If the waiter was kind and saw my panic, she'd suggest a few choices. Or whomever I was with make a suggestion or, better yet, would order for me. Even when I got a little more familiar with the territory, there were moments. Again, the waiter with the questions. "Martini, yes ma'am. Up? Dry? Shaken? Stirred? 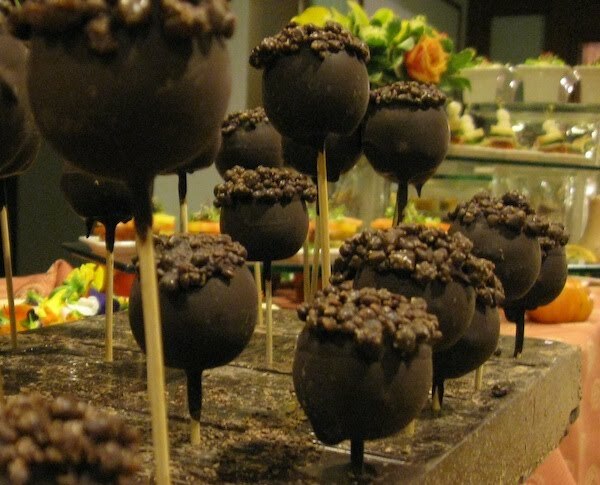 Olives?" Another panic, a smile frozen on my face. "Uhhh…"
But now, well, now it's another story. I quiz the waiter on the gins available, look disappointed if they don't have Plymouth or aren't familiar with the proper recipe for a Negroni. Oh, and could you ask the bartender not to pulverize the mint in the mojito, just bruise it gently? Thanks. Though there are areas I'm not familiar with. Recently I've been expanding the repertoire to include Manhattans, which always remind me of the drinks my father made, the ones requiring not much beyond ice and maybe a spoon to stir them with. Last night, Dave, who's always scouting for drinks to add to the list, suggested a sidecar. He'd read a piece by Eric Asimov in the Times extolling it as the perfect cocktail. 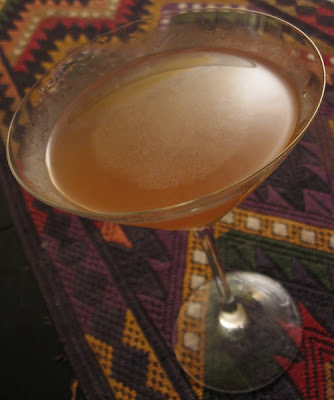 Made with bourbon or brandy and lemon juice, it has the appearance of unfiltered apple cider when served in a martini glass but has that classic cocktail taste, at once bright and warming. Asimov describes it as refreshing and "good any time of the year, but especially in the warmer weather." Until those temps get here, I'm thinking we may need to do a test of several recipes to determine our favorite. Here's Asimov's version to tide us all over. Fill a cocktail shaker with ice. Add ingredients and shake. (Asimov says he tries to count to 100 but will stop short if the shaker gets too cold.) Strain into two glasses and serve. OK, I admit it. I was verklempt, even teary, when Dave and I walked into the Little Red Bike Café and Evan was working the counter, taking orders from the customers streaming in the door to wish them well on their last day. A tux for the last hurrah. Then I saw Ali in the kitchen with a big red flower in her hair, working the panini toaster, and all I could do was give her a hug since, if I'd tried to talk, I'd have burst into tears. If I could have, what I would have said was, "Good luck, you two, and see you soon." 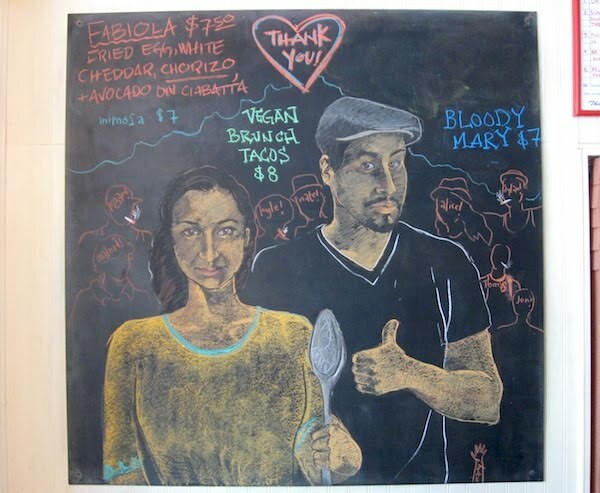 For the full story on their adventure and the reasons for closing, see the blog that chronicled their journey. When it comes to the seasonal foods of the Northwest, contributor Jim Dixon of RealGoodFood likes to keep it simple—the fewer adornments, the better to let their pure flavors come through. 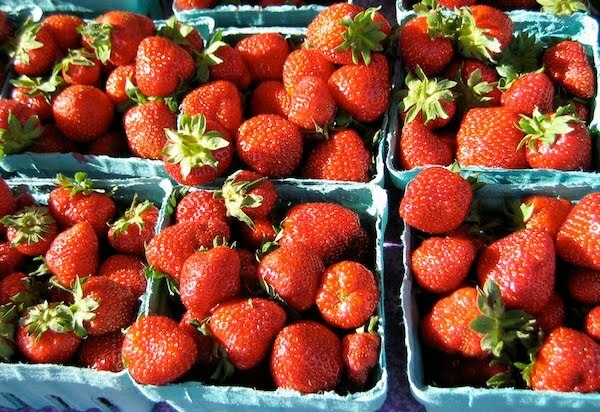 Locally grown strawberries are beginning to show up in the markets, although in short supply because the spring monsoons have affected the harvest. My approach is to eat them while I can, then wait until next year. I like them almost any way except cooked (an abomination in my opinion) or combined with rhubarb (best by itself). But this approach is particularly delicious. Make some creme fraiche by mixing a couple of tablespoons of Nancy’s yogurt (some people use buttermilk, but Nancy’s has the live bacteria cultures necessary) with a half pint of heavy cream. Cover and leave in a warm place for at least 24 hours, then chill. Spoon some creme fraiche into a small bowl, add a little sugar to taste (I like to use the bigger crystals, but plain sugar, maple syrup, or honey will all suffice), and drizzle with Profumi Estensi aceto balsamico (you need a true balsamic vinegar, viscous, sweet and acidic, for this; don’t use the industrial stuff, cheap red wine vinegar with caramilized sugar added sold as balsamic vinegar in the supermarket). Rinse your berries, dip into the creme fraiche, and eat. Repeat. If St. Johns feels more like a small town than a neighborhood, there's a reason. It was laid out as an eight-block city by James Johns in 1865 and wasn't annexed by the city of Portland until 1915. Opening day of the St. Johns Farmers' Market dawned sunny and clear, with the green spires of the stunning St. Johns bridge (named for the neighborhood) visible from the edge of the market. Strawberries were the theme of the cooking demonstration of Pitxi Dining Room and Wine Bar chef and owner Edward Martinez, as he whipped up a strawberry coulis and nearly got trampled by the small children running up to taste the samples he offered. The Ladybug Organic Cafe had an impressive display of its whole wheat flax bread, fresh-roasted coffee beans and jars of hot sauce, and the bags of English muffins were flying off the table as neighbors took advantage of the opportunity to take some home for breakfast. Garlic was the big draw at Sasquatch Acre, Evan Driscoll's one-acre farm on Sauvie Island, with bulbs of spring garlic and the curling scapes holding sway over the mustard mix and snap peas. Cece Hall Lilla Farm Lavender was running wands of lavender through a sieve by hand, the scent wafting down the aisle and drawing shoppers to her booth stocked with dried lavender, lavender oil and lavender room spray. 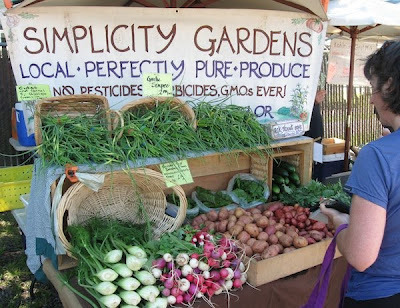 Details: St. Johns Farmers' Market. Saturdays, 9 am-1 pm, in St. Johns Plaza at the intersection of N Lombard and Philadelphia. It looked like the whole neighborhood, including its canine contingent, attended opening day at the Montavilla Farmers' Market, with the head count of the human portion topping last year's biggest day by more than 40%. There were several new food vendors, including Kebab-A-Rama, who were making the bread for their kebab sandwiches over the fire before the market opened. 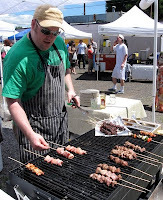 John Sonksen (left) was kept busy at the grill as customers went crazy over his sauces. Simplicity Gardens brothers Vyasa and Gopal Thomas (top photo) were showing off their jewel-like radishes in hot pink, purple, red and white, and flashing wide smiles as they described the carrots they've grown this season. And there was enough sunshine to warrant a line at Liquid Sunshine Lemonades, and it was no surprise that the fresh-crushed strawberry was the favorite by a mile. 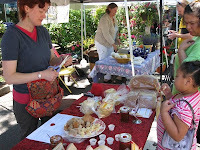 Details: Montavilla Farmers' Market. Sundays, 10 am-2 pm, in the 7600 block of SE Stark between Mt. Tabor and 82nd Ave. If you've never heard the sound of hearts shattering into a million pieces, all you have to do is read through the most recent posts on the Little Red Bike Café blog. The blog has chronicled, with painful honesty, the journey this young couple has taken through the ups and downs of starting a restaurant and keeping it running, with all the joys, missteps, sorrows and victories that entails. With the café closing at the end of the week, and with the future (as yet) uncertain, I wish them all the best and look forward to their next adventure. Good luck, Ali and Evan! 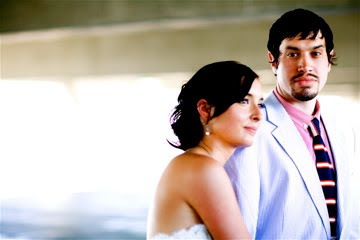 Photo of Ali and Evan by Our Labor of Love. Who knew that beer would be an important ingredient in the recipe for a long-term marriage? Mine, anyway. For his birthday, the last thing Dave wanted was a gadget or a tie (yeah, right). We'd been talking about going down to Eugene to visit Ninkasi, one of his favorite NW breweries, for some time, so when I suggested a field trip for his birthday he was all up ons. And since we would be in the neighborhood, a side trip to nearby Oakridge to check out Brewers Union Local 180 seemed like an appropriate add-on. After all, Dave was a big fan of Ted Sobel, publican and brewer of BUL180, and Sobel's blog has been a regular on his feedreader list. 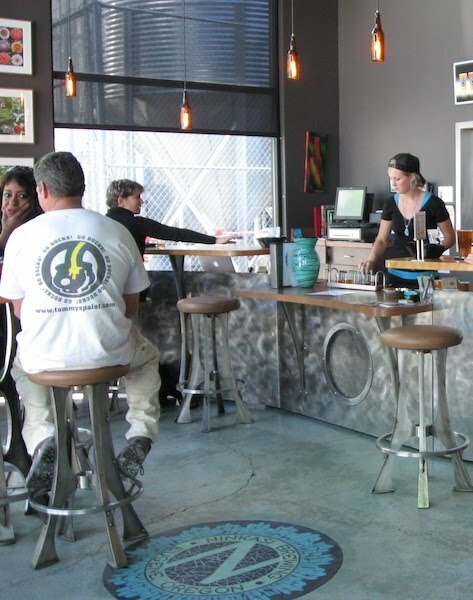 Furthermore, the pub has six of its cask-conditioned, gravity-dispensed beers on tap at any given time, plus guest taps on CO2. Need I say more? Brewers Union was our first stop, and we made the trip down just past Eugene in record time, taking the very scenic, very lovely drive along the forked creeks that eventually merge to become the mighty Willamette. Oakridge itself is a small village along the middle fork, and Sobel's English-style pub is located on its eastern end, with a pleasant patio and cheery umbrellas marking the entrance. You belly up to the bar inside to order from the nice fellow manning the taps, who on this day was not Sobel because he was up in Portland at an event (wouldn't you know it). 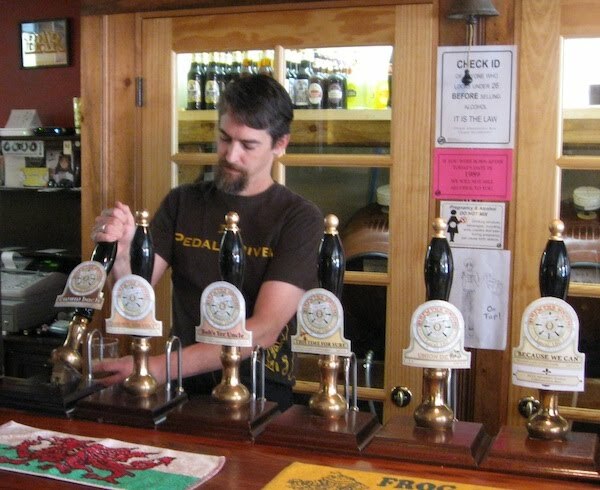 I went for the Union Dew IPA while Dave requested a Cwrw Bach, a Welsh mild ale. Both were fairly low in alcohol and the IPA wasn't hyper-hopped like many of our Portland micros. Or, as Sobel himself put it, "it's plain, ordinary, mundane session beer. Nothing ridiculous, over-hopped, mega-gravity or imbued with lynx droppings. Nothing aged in one of Leo Kottke's old Taylor 12-strings for eight months. No exotic herbs flown in from Ouagadougou. No cold-filtration through artisan-designed glassware embracing dust from the tombs of the Pharaohs. These ales were designed for quaffing." We loved them. And the fish'n'chips were outstanding and cheeeeeeeeeap compared to PDX prices. 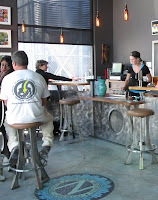 By the time we got to Ninkasi we were a bit blown out from driving and their tasting room looked like it was under construction, perhaps undergoing some major expansion due to raging popularity. We did have a token pint, though, finding it thoroughly satisfying as expected. Maybe next time the dust will have settled and we won't be two pints along already. Thank heavens the weather was fabulous and we sailed home without incident, the iPod plugged into Chili, blasting away. 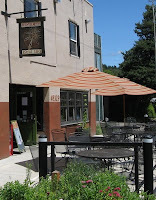 Details: Brewers Union Local 180, 48329 E First St., Oakridge. Phone 541-782-2024. 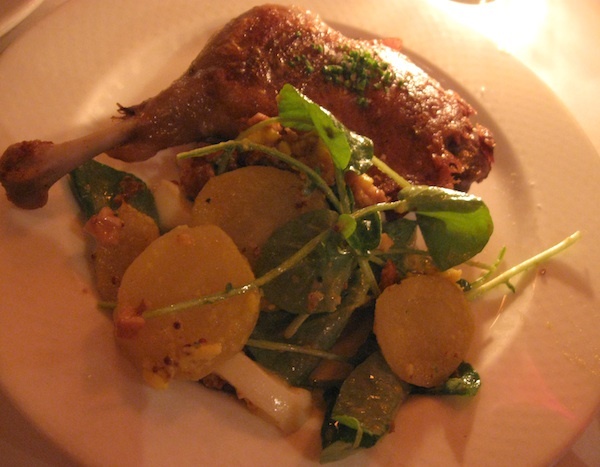 "The French term cuisine du marché translates roughly as 'cooking from the market,' and it’s an apt term for how many of us in Portland cook and eat — local, seasonal and spanking fresh. 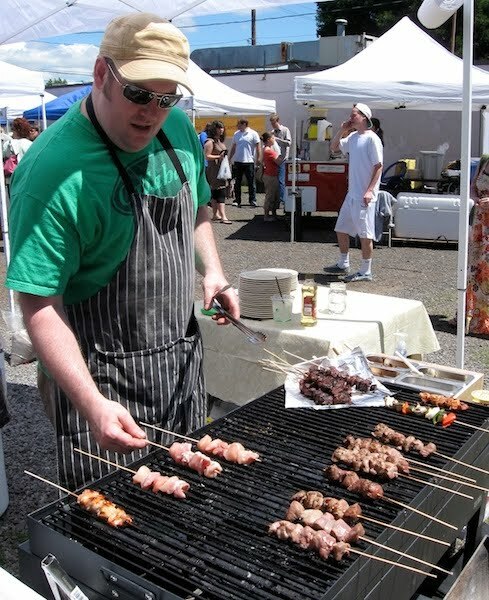 Get to a market early and you can catch some of Portland’s best chefs prowling the aisles for the specials that will grace their menus that week, if not that very day." Read the rest of the article, "Best Eats at Portland Area Farmers' Markets," and find listings for what's good and where from this month's issue of MIX magazine (with drool-worthy photos by Motoya Nakamura, above). Remember the Vacuvin, guaranteed to "slow down…taste-destroying oxidation"? Or the wine cork puller with the two prongs? How about the Rabbit? I've lost count of the gadgets we've gone through over the years as they broke or were lost in the back of the utensil drawer along with the various can't-live-without-it items like the beer can chicken stand. My brother, a wine guy and debunker of pretentiousness, was moved to comment on one of the latest of those, the Vinturi, which claims to produce "a better bouquet, enhanced flavors and smoother finish" in a bottle of wine. When a guy gives his business a name that's a bad (though appropriate) pun, who am I to argue? And when he dishes out some of the best British-style fish and chips (or Scottish, as the case may be) to be found in the Northwest, then I'm happy to call him whateve he likes. 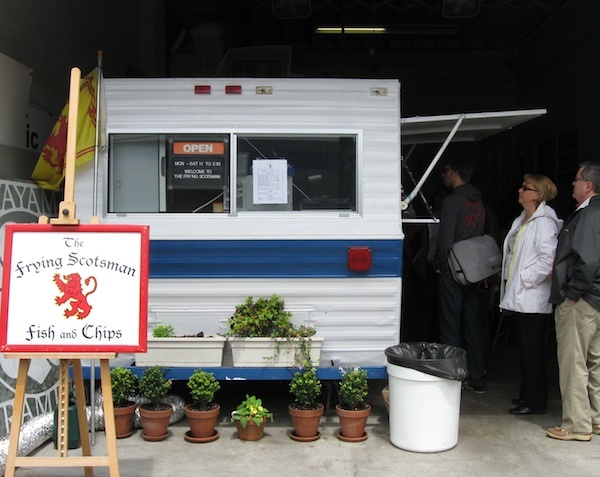 James King is just that guy and his cart, The Frying Scotsman, is just that kind of place. My friend Ivy agreed to join me on an expedition to a part of NW Portland that has neither the Pearl's Rodeo Drive drive or the upscale-gone-downscale of 23rd. I'd heard that "Slim Jim," as he's known to friends, was frying up and dishing out some fine product from his converted vacation trailer parked in a small garage (complete with roll-up door), and we were not disappointed. 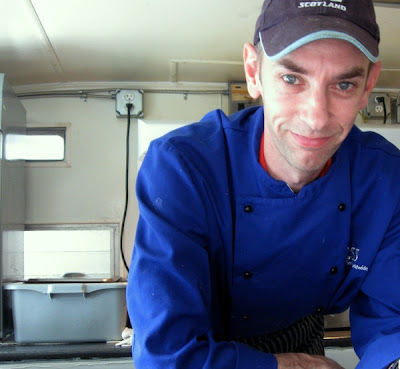 He offers the usual cod and halibut, but also features more unusual choices like red snapper, mahi mahi and even haddock, a fish that I'd only seen in New England, as well as a salmon special on the day we were there. Each order is well under ten bucks and comes with house-made coleslaw, rich and creamy, and a more-than-decent tartar sauce. 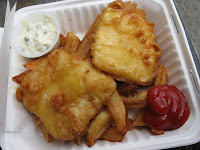 Chips are of the plank variety, but still crisp and well-cooked, and the thickish batter is crunchy on the outside and meltingly tender on the inside. It has the added benefit of staying with the fish rather than other versions where after one bite the fish falls out leaving you holding a soggy envelope of half-cooked batter. There are only two tables under cover, so if all the spots are spoken for, you can either eat in your car or sit on the curb. But this spot is worth the trip if you're a die-hard fish'n'chips lover, and James' lilting Scottish accent and shy smile only add to the attraction. Details: The Frying Scotsman, 2219 NW Raleigh. 503-706-3841. I love Anthony Boutard of Ayers Creek Farm because of his passion for his land and his commitment to doing things his own way for his own reasons. And because he's truly funny. In this video about planting corn, listen for classic Anthony lines like "I'm going to plant the orange first. Why? Because it's orange." For additional information about what he's doing, read the accompanying post at Cooking Up A Story. And look for Anthony's "Farm Bulletins" for GoodStuffNW to start up again at the end of June when he and Carol return to the Hillsdale Farmers' Market. The other day I heard someone call the weather we've been having "June-uary," an apt descriptor for the chilly deluge that's drowned previous rainfall records and nearly pushed the Willamette over its banks for the first time since the Clinton administration. And while the weathermen are saying it's going to start drying out soon…btw, that job has to have been fun lately, huh?…I can almost guarantee there are going to be a few more evenings where it'll be nice to turn on the oven and fill up on something warm and hearty. The other night I found myself staring at the Le Creuset and thinking a nice casserole would be just the thing for dinner. Then I remembered a polenta dish I'd experimented with a few years ago. Since we still have a few bags of Ayers Creek's Roy's Calais flint corn in the freezer from some propitious hoarding I did last fall, I pulled one out and grabbed some frozen tomato sauce from last summer. 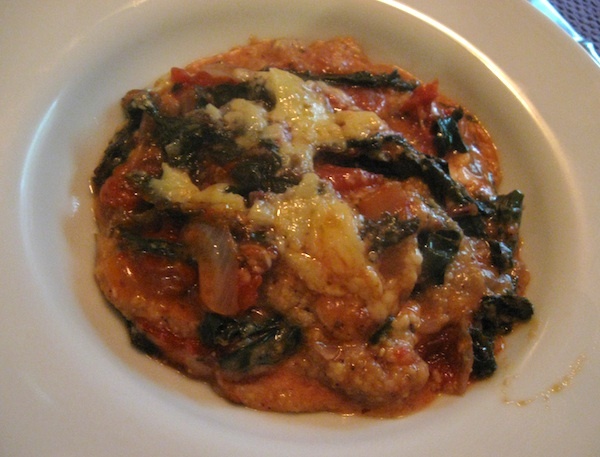 A little chopped kale, a little cheese and—voila!—instant comfort. Preheat oven to 350°. While oven warms, heat stock in medium saucepan over high heat, adding butter at the beginning. When it starts to boil, reduce heat and whisk in polenta. Keep at bare simmer and stir for a few minutes until it is the consistency of porridge, adding salt and pepper to taste. Reduce heat to lowest setting and cover, stirring occasionally to make sure it doesn't burn. Heat sauce until it is warm. Stir in kale and allow it to wilt. Grate cheese. Pour half of polenta into 2 1/2 qt. casserole, top with half of sauce and half of cheese. Pour rest of polenta over that and top with rest of sauce and cheese. Place in oven and bake for 30 min. until cheese melts and begins to brown. This dark and rainy spring has made me more impressed than ever with our intrepid farmers, not only considering the hard work required to grow crops but with the early mornings and long hours they spend at farmers' markets, standing in the cold and rain, bringing the incredible bounty of our region to all of us. 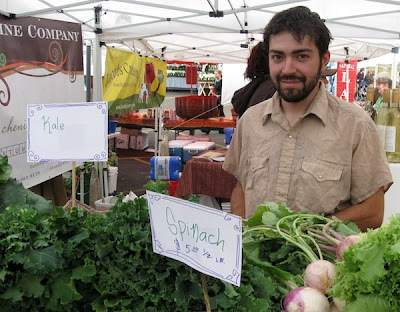 The hidden gem that is Northeast Portland's Lloyd Farmers' Market is ramping up for spring with mushrooms both fresh and dried from "Wild Bill" Cole's Nature's Choice. Always a font of information, this week Bill featured one of the biggest porcini mushrooms I'd ever seen that was easily the diameter of a soccer ball. And I discovered Fressen is now making its own granola and looks to be of the not-so-sweet variety that I prefer. Packed with dried fruit and nuts, at $6 a bag it looks like a deal. And the Albions were on full display at Unger Farms, who were bursting with the news that they're about to open their very own farm store out in Cornelius. Look for unusual organic greens from that quiet guy with the very sparkly blue eyes named Curly at Osmogaia, and piles of carrots and seasonal veggies from Rick Steffen Farm. And if you ask really nicely, you might just get a hot-off-the-press playing card (put out by the Food Alliance) from the person at the Rogue Creamery table…collect 'em all! Details: Lloyd Farmers' Market. Tuesdays, 10 am-2 pm in the Oregon Square Courtyard on NE Holladay St. between NE 7th and NE 9th Aves. The sun came out and beamed all day for the shoppers at the Hollywood Farmers' Market, with sun-dazzled children almost too stunned to dance to the music being played by local musicians. Heck, even the dogs (allowed after 10 am) were well-behaved! Sophie Rahman (right) was doing huge business at her Masala booth, making her authentic South Indian masala dosas for the hungry crowds. Like a crepe or burrito, it's a filled wrapper, only this one is made from a sourdough-like, fermented lentil batter that is filled with a turmeric-infused, spiced potato mixture, both vegan and gluten-free. And, need I say, delicious! The guys at Big B Farms were in a hugging mood (top photo) as they kidded around with customers snatching up bunches of basil, spring squash and herbs, and were hatching plans to expand their empire beyond the three tents they currently have with the help of a lift truck, if necessary, to get their way. Things at Sweet Leaf Organics on the other side of the market were a bit more sedate, though the line to the checkstand snaked out into the aisle as happy shoppers exclaimed about the weather and compared recipes for strawberry jam. Details: Hollywood Farmers' Market. Saturdays from 8 am-1 pm on NE Hancock between 44th and 45th Aves. I could tell the battery was wearing down. The lights were dimming intermittently, the engine was chugging when it should have been humming and I was beginning to hear clinking and clanking when there should have been purring. 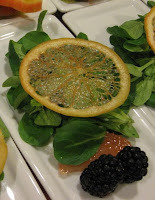 Grapefruit, mache and blackberry salad at the Fairmont. Thank goodness a kind samaritan offered a helping hand in the form of a free pass to a day-long writing seminar in Seattle, given by Dianne Jacob of "Will Write for Food" fame, one that came with a room at the graceful Fairmont Olympic, the grande dame of the city's historic hotels. Dave, self-sacrificing guy that he is, volunteered to putter around the Emerald City's beer halls while I was otherwise occupied, then meet up for cocktails and dinner. After a lunch provided by the hotel's chef, Gavin Stephenson, featuring dried, shaved grapefruit slices on the salad and pop rocks in the dessert, we hit a little speakeasy my brother had told me about called the Zig Zag Café (top photo) that was tucked down a stairway behind the Pike Place Market. With the rain pouring down it was hard to locate, but we found its dark doorway and were ushered to a corner table with a good view of the bar where we could watch the tango between bartenders, servers and customers as they noshed, shook and drank. A place where the classics reign, I ordered a Manhattan, my new favorite cocktail, and Dave had his usual martini (dry, up, olives). They were perfection. A day spent in a brightly lit hotel meeting room receded further into the background with every sip, and by the time I bit down on the whiskey-soaked amarena cherry it had stopped raining outside and the sun was slipping into Puget Sound. Looking out at the rain (and Chili) at Lark. We'd decided on a little place called Lark for dinner, a spot that came highly recommended (thanks, Langdon!) and was just a short drive up the hill from the hotel. Not in the mood for a big, fancy (and expensive) dinner, I knew the simple storefront was just the ticket when we drove up, and walking in it was clear we'd made the right choice. For some reason it reminded me of a boathouse, though there was nary an oar or float in sight, with unfinished wood rafters and a simple, open room with artwork on the walls and sheer curtains to break up the space and muffle the sound. 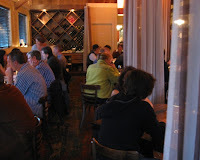 Seated on a banquette in the back against the windows, with tables near enough but not too close together, it was busy without being bustling and intimate but not dark. 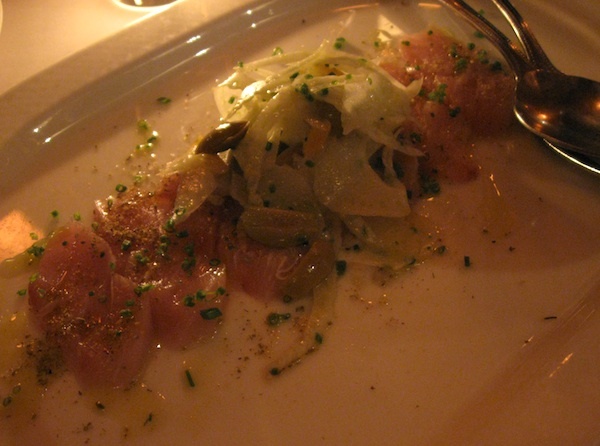 Yellowtail with olives and preserved lemon. Already well-cocktailed, we ordered a moderately priced bottle, a Mas Que Vinos Ercavio tempranillo, a full-bodied and earthy Spanish red. We also started with a half dozen Penn Cove oysters from Whidbey Island, fresh oysters being something we seemingly can't avoid ordering when we see them on a menu. Firm and briny without being meaty, these came with a lemon granita that, to my mind, would have overwhelmed their lovely brightness, so we shared it as a palate-cleanser before the next course came, a carpaccio of Yellowtail with preserved lemons and green olives. 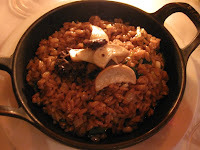 Farro with mushrooms and ramps. I'm guessing the olives were cerignola or something like them, slivers that gave the softly textured fish a bit of bite but adding only a mild saltiness. Someone in the kitchen has a deft hand with the subtle of interplay of flavor and texture without being precious about it. 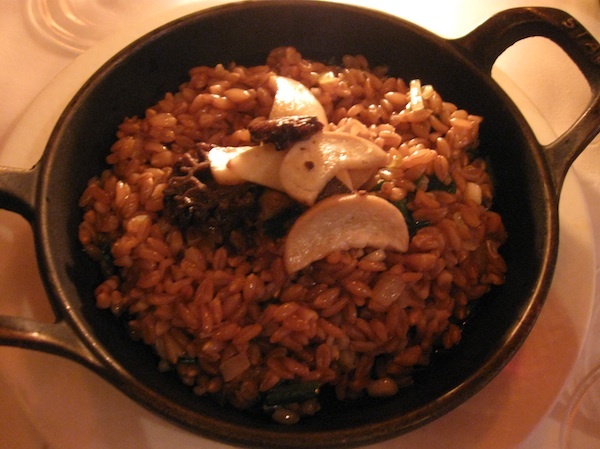 Which was evident in the next course, as well, a Bluebird Grain Farms farro with wild ramps and mushrooms that came in a tiny cast iron pan. An easy grain to over or undercook, this was toothy and richly flavored, the color of warm earth and tasting of spring. Our mains, mine a hefty duck leg confit that was probably the best version I've had from that bird, meaty and luscious with crispy, salty skin, was served with lightly dressed, sliced new potatoes and watercress. 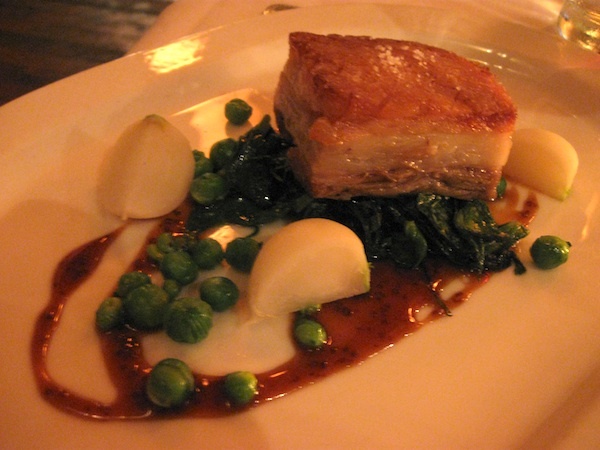 Dave opted for the pork belly, a square of fatty pig that came with spring peas and quartered bulbs of spring onions sitting on braised greens drizzled with a mustard jus. Need I say his knees were buckling? I also have to say that the service here is exceptional…friendly and casual yet efficient and knowledgeable. 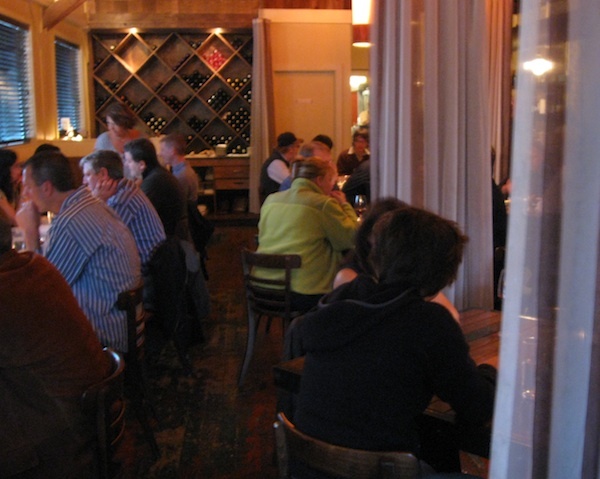 Our server was well-informed about the wine list, the entrées and sources of ingredients, but only engaged when asked. With a menu this incredible and varied, and ingredients treated with such loving respect, it'll be hard to not return on our next trip up north. Details: Fairmont Olympic Hotel, 411 University St. Phone 206-621-1700 or 1-888-363-5022. 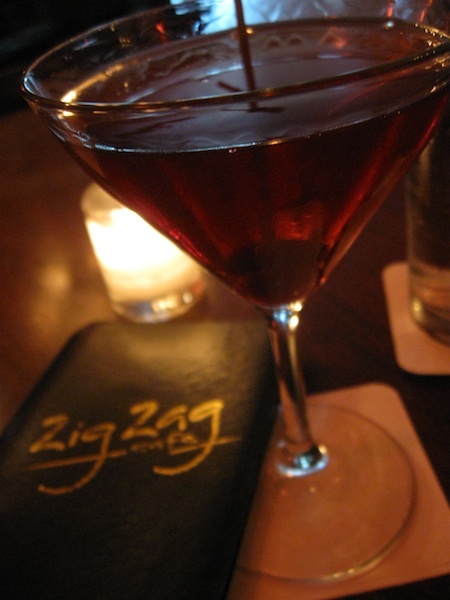 Zig Zag Café, 1501 Western Ave. Phone 206-625-1146. Lark, 926 12th Ave. Phone 206-323-5275. So when Chris Israel of (need I say?) Zefiro, Saucebox and 23Hoyt fame announced he was opening a downtown restaurant dedicated to "alpine cuisine," what came to mind was a prosaic "What the…?" Though, when it opened with the umlaut-laden name of Grüner, really good things were reported to be coming from the kitchen, with nary a lederhosen or accordion in sight. Then my friend Mary (yes, of the Waffle Window) suggested meeting there for her birthday dinner, and I was all in. Located on a downtown corner near the Ace Hotel, after finding a rock star parking space right outside, I am embarrassed to admit I was stumped when it came to finding how the heck to get into the place. Turns out the front door is hidden in a darkened niche, and I only found it when my friends saw me wandering up and down and took pity on me by knocking on the window and pointed to it. Oh, well. Though the rest of the evening went splendidly, I have to say the cocktail menu was less than inspired, though that may be due to newness rather than talent, and once we switched to wine things improved considerably. 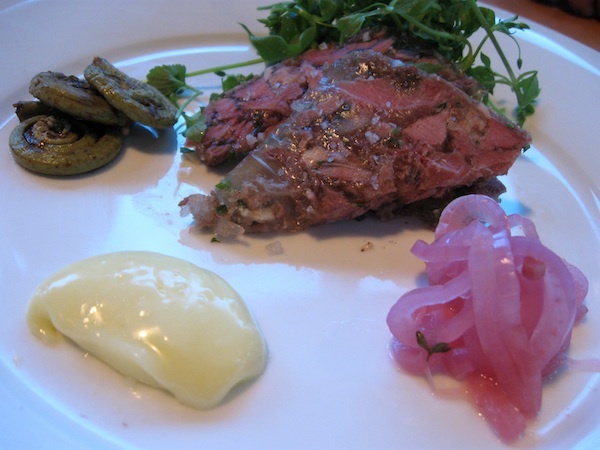 Our sampling of the appetizer offerings was eye-opening as well, starting with the creamy and rich rabbit terrine and the slices of head cheese with pickled fiddleheads and aioli. We also tried the Alsation onion tart with speck, which came to the table looking like a pallid pizza but had a nice crunch and a wonderfully sweet onion bite. 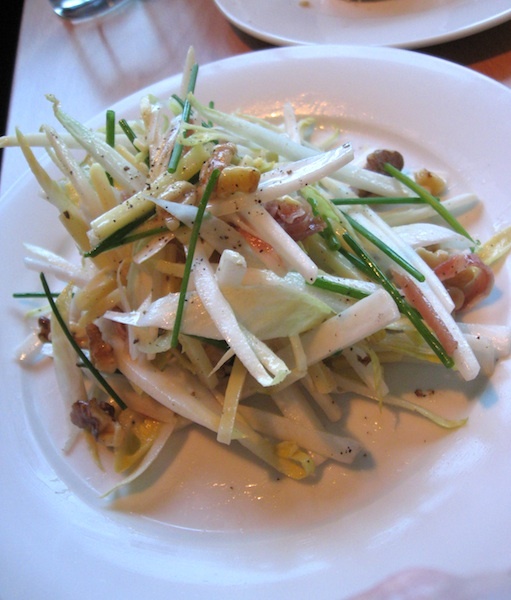 The two salads we had, one a combination called the "Grüner," will probably change as ingredients come and go, but on the night we were there it was composed of fennel, endive, celeriac, walnuts, chives and strips of roasted beets. Crunchy and with enough different flavors to make each bite a surprise, this was terrific. The shaved radish salad was a gorgeous plate of thin slices fanned out and topped with dressed microgreens, but all I could think of was that I'd sure hate to be the kid who no doubt was in the back laying out those babies. Asparagus and fresh pea soup. 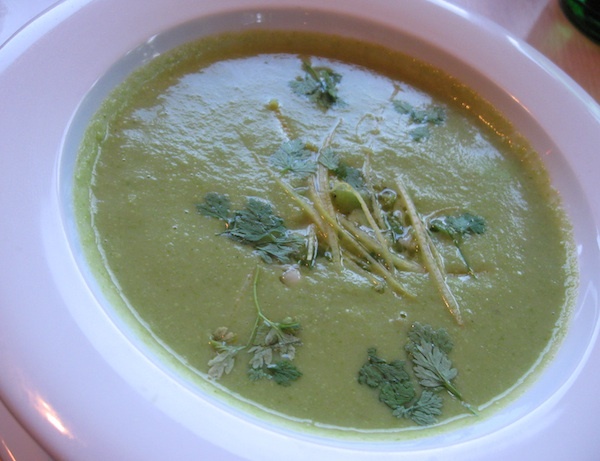 The generous serving of asparagus and pea soup looked a little gloppy sitting in the bowl, but one spoonful of its intense greenness and I was tasting the promise of spring…it was so good it was hard not to pick up the bowl and lick it clean. The star of the meal was definitely the spaetzle (top), little rolls of extruded dough that, when properly made, have the same magical pillowy lightness ascribed to great gnocchi. 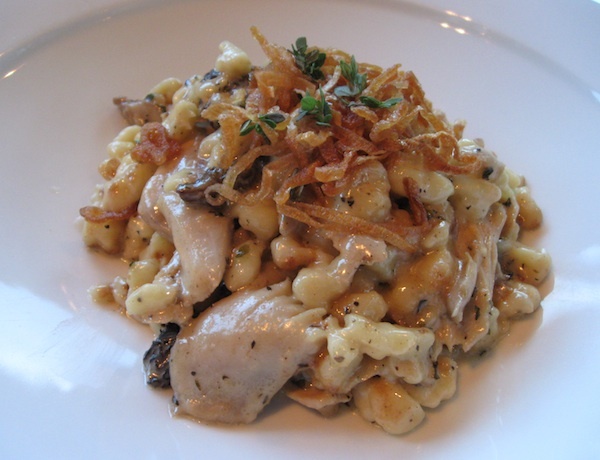 Bathed in a light, creamy sauce with chicken, mushrooms and frizzled shallots, this deeply flavorful version was to die for. But no matter how hard I tried, I just couldn't warm up to the pork schnitzel, a pounded, breaded, deep-fried cutlet that always seems dry and overcooked no matter who makes it. No doubt it's some failing on my part, but it's just too reminiscent of the thin, tasteless pork chops of my youth. Sorry. So, while not a convert to this cuisine, I have to say I was impressed. Though next time I'll leave the dirndl at home. Details: Grüner, 527 SW 12th Ave. Phone 503-241-7163.